Sparkling fine gemstones entrance players of the innovative Brilliant Sparkle video slots from Merkur. With a total of five reels and ten potential pay lines, the game furnishes players with an opportunity to win some treasure while immersing themselves in a vividly colored screen of shimmering precious stones. 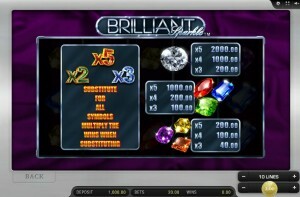 Whenever three or more shiny gems line up across an active pay line, Brilliant Sparkle offers a payout. The slot game furnishes sustained excitement, as participants strive to win the biggest jackpots. 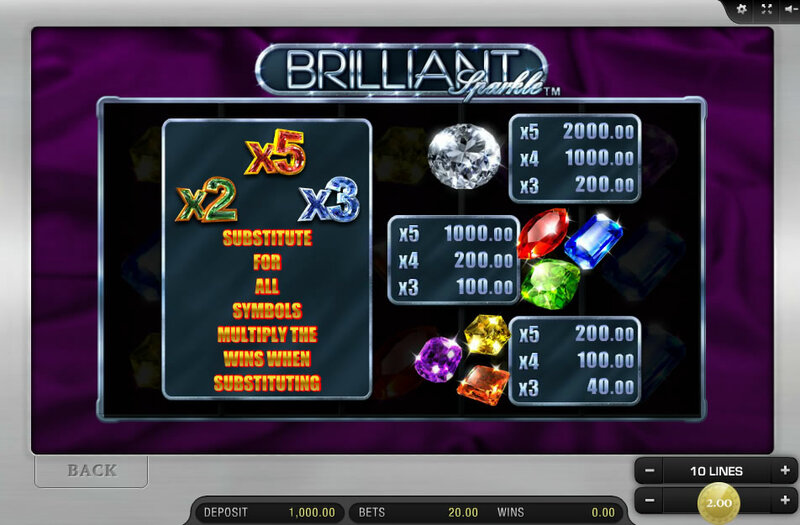 Collecting a row of brilliant diamonds in conjunction with a x5 multiplier symbol on the first reel promises the most significant jackpot in this engrossing game. The designers furnish an auto play button and a “max bet” button along the bottom of the screen to assist players who wish to spin the reels automatically, or place the largest possible bet. After every spin of the reels, players enjoy the opportunity to win across multiple activated pay lines. Additionally, in the first reel, multiplier symbols enhance winning by x2, x3 or x5. These icons essentially double as wild card substituting for gems. Every aspect of Brilliant Sparkle appears to reinforce the dominant theme of precious, alluring diamonds. Although this video slots utilizes techniques sometimes found in standard fruit games, it does not include any familiar fruit symbols. The rich purple screen highlights colorful shining symbols: white diamonds, red rubies, blue sapphires, green emeralds and other precious stones in shades of orange, yellow, and purple fill the reels. When three or more of the same type land across an active pay line, the icons shine and revolve. The game employs comfortable jazz music in the background. Most players probably spin the reels for long periods of time without growing tired of the easy sound effects, which do not appear discordant or distracting. 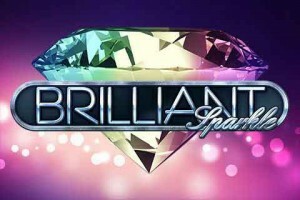 Although animation remains limited, Brilliant Sparkle offers enjoyable video slots entertainment. One feature of the game which contributes to the excitement also potentially requires players to exercise budgeting discipline. By hitting the “max bet” button, participants ensure that they will obtain a reward whenever winning symbols line up across an activated payline. A single spin of the reels can produce wins along more than one payline on the screen. Should a player risk less than the maximum number of coins during a spin of the reels, a possibility exists that fewer jackpots will accrue because some symbols might line up on non-active paylines that won’t offer any returns to the player. 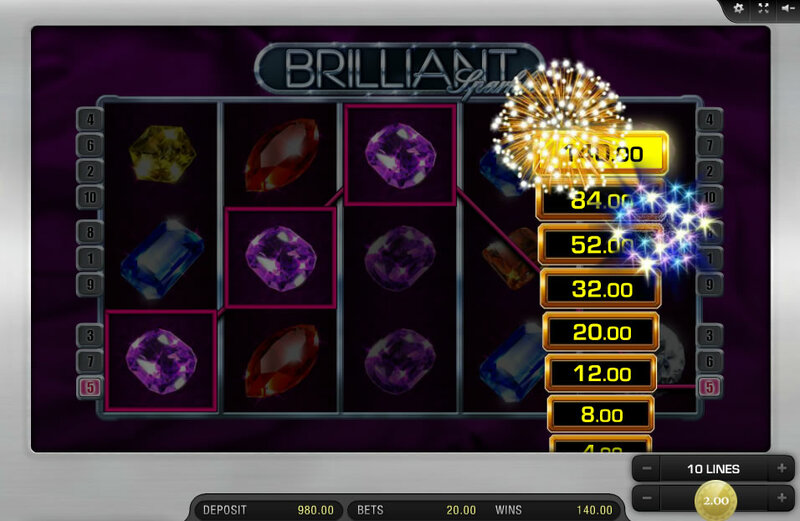 One screen in the game which arises in some versions of non-progressive standalone video slots whenever a player hits an optimized diamond jackpot briefly displays a vertical scale of maximum returns and flashing firework symbols. 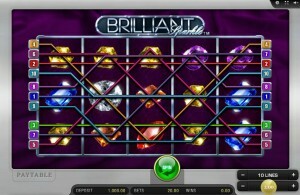 It marks the successful attainment of a maximum 5x Brilliant Sparkle jackpot. Brilliant Sparkle interests players attracted by the promise of winning multiple jackpots. The multiplier/wild card symbols in the first reel offer the promise of significantly multiplied winnings during any given spin. With five reels and ten separate paylines, the potential rewards of this exciting video slots game from the German gaming company Merkur could add up, depending upon the denominations of coins inserted by players. How long can the lure of diamonds fascinate? If Brilliant Sparkle offers any clues, shimmering diamonds remain timeless!